Twisted line is a fine choice for mason line and other marking needs. 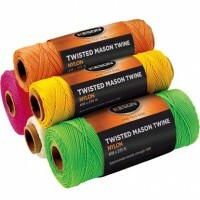 Choosing twisted mason line is often an economical choice. You get 10% more line per spool. 18-gauge line with an approximate tensile strength of 160 pounds. 275 feet = 1/4 pound, 545 feet = 1/2 pound, 1090 feet = 1 pound. GT275 108121 green 275 ft.
GT545 008131 green 545 ft.
GT1090 108145 green 1090 ft.
OT275 008063 orange 275 ft.
OT545 008070 orange 545 ft.
OT1090 008087 orange 1090 ft.
PT275 008094 pink 275 ft.
PT545 108107 pink 545 ft.
PT1090 008117 pink 1090 ft.
WT275 008001 white 275 ft.
WT545 008018 white 545 ft.
WT1090 008025 white 1090 ft.
YT275 008032 yellow 275 ft.
YT545 008049 yellow 545 ft.
YT1090 008056 yellow 1090 ft.